Beginning with an Olympic ski race in northern Utah, this heartfelt book from award-winning writer and photographer Stephen Trimble takes a penetrating look at the battles raging over the land—and the soul—of the American West. Bargaining for Eden investigates the high-profile story of a reclusive billionaire who worked relentlessly to acquire public land for his ski resort and to host the Salt Lake City Winter Olympics. 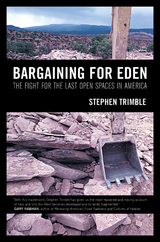 In a gripping, character-driven narrative, based on extensive interviews, Trimble tells of the land exchange deal that ensued, one of the largest and most controversial in U.S. history, as he deftly explores the inner conflicts, paradoxes, and greed at the heart of land-use disputes from the back rooms of Washington to the grassroots efforts of passionate citizens. Into this mix, Trimble weaves the personal story of how he, a lifelong environmentalist, ironically became a landowner and developer himself, and began to explore the ethics of ownership anew. We travel with Trimble in a fascinating journey that becomes, in the end, a hopeful credo to guide citizens and communities seeking to reinvent their relationship with the beloved American landscape. Writer, photographer, and naturalist Stephen Trimble has won awards for his nonfiction, his fiction, and his photography, including the Ansel Adams Award from The Sierra Club. His books include The Sagebrush Ocean: A Natural History of the Great Basin, The People: Indians of the American Southwest, The Geography of Childhood: Why Children Need Wild Places (with Gary Nabhan), and Testimony: Writers of the West Speak on Behalf of Utah Wilderness (co-compiled with Terry Tempest Williams).